Michael Howard Finley (born March 6, 1973) is an American retired professional basketball player and current film producer and also Vice President of Basketball Operations for the Dallas Mavericks. He played 15 seasons in the National Basketball Association (NBA). He was a two-time NBA All-Star and won an NBA championship with the San Antonio Spurs in 2007. In his first season with the Mavericks, Finley led the team in scoring, assists and steals. Along with point guard Steve Nash and forward Dirk Nowitzki, he became an integral part of the Mavericks' late '90s "run and gun" offense. In 2000, he was selected to represent the Western Conference in the 2000 All-Star Game, in which he scored eleven points. On January 23, 2001, Finley tied an NBA record by recording eight steals in one half of a game. In 2001, he was again selected to represent the Western Conference on All-Star weekend. He played for the US national team in the 2002 FIBA World Championship, which lost a record-three games and failed to win a championship for the first time in a major competition since FIBA opened international competitions to NBA players. While Finley began to play more of a supporting role (small forward) as he aged and teammate Dirk Nowitzki blossomed, he remained a clutch player for the Mavericks. In 2005, he was waived by Dallas to avoid luxury taxes (as part of the league's new labor agreement) on his 51.8 million US$ salary over the next three years. 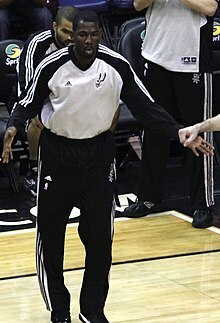 Finley became an unrestricted free agent and after being pursued by Detroit, Miami, Minnesota, and Phoenix, he elected to remain in Texas with the San Antonio Spurs. ^ Stein, Marc (March 4, 2010). "Michael Finley says he has agreement to join Boston Celtics". ESPN.com. Retrieved March 4, 2010. ^ "Celtics sign Michael Finley". NBA.com. March 6, 2010. Retrieved March 7, 2010. ^ "Michael Finley". JockBio.com. Retrieved May 26, 2013.